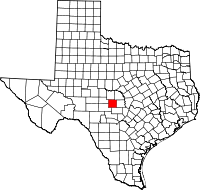 Mason County is a county located on the Edwards Plateau in the U.S. state of Texas. At the 2010 census, its population was 4,012. Its county seat is Mason. The county is named for Fort Mason, which was located in the county. 1851, July 6 – Fort Mason is established. 1858, January 22 – Mason County, named for Fort Mason, is established by an act of Texas state legislature. First post offices are established. 1860 Population of 630 includes 18 slaves. February – County, spurred in part by anti-slavery sentiments of German residents, overwhelmingly votes against secession from the Union. March – Fort Mason surrendered to the Confederacy, who leave it mostly vacant and thereby cause an uptick in Indian attacks on the area. May 20 – Voters select town of Mason as County Seat. 1866–1868 Federal troops occupy Fort Mason, only to eventually abandon it. 1869 Courthouse and jail are erected. 1870 May 16 – Herman Lehmann and brother Willie are captured by Apaches, but Willie escapes within days. County’s first newspaper begins publication. Hoo Doo War over cattle rustling. Most famous participant in the war is Johnny Ringo, who on September 25, 1875, kills James Cheyney. Courthouse fire destroys all records. 1878, May 12 – Herman Lehmann, escorted by soldiers, finally returns to his family. 1880s Manganese is discovered. Wakefield Company opens Spiller mines. Iron ore is discovered. Prospecting begins for gold, silver and coal. 1882–83 Hereford cattle are introduced into the county. Provisions made for county wide road work. 1887 The county petitions for state aid for needy residents. 1897, May 27 – John O. Meusebach dies at his farm at Loyal Valley, is buried in the Marschall Meusebach Cemetery at Cherry Spring. 1890s County places a bounty on wolves, wildcats and mountain lions. 1902 Mason installs its first telephone in the county judge's office. 1913 County hires an agricultural agent. 1918 October 3 – Eighteen months after United States Congress declares war on Germany, the Mason County Council of Defense draws up resolution to abandon the use of the German language in the county. The majority of County residents are of German heritage. 1919 First oil and gas lease in the county. Construction begins on the Mason County section of the Puget Sound-to-the-Gulf Highway. 1920s Radios come to Mason County. 1938 Pedernales Electric Cooperative is formed to provide rural electrification . Mason County joins in June. 1946 Local soil-conservation board organized. County schools consolidated. According to the U.S. Census Bureau, the county has a total area of 932 square miles (2,410 km2), of which 929 square miles (2,410 km2) is land and 3.4 square miles (8.8 km2) (0.4%) is water. At the 2000 census, there were 3,738 people, 1,607 households and 1,110 families residing in the county. The population density was 4 per square mile (2/km²). There were 2,372 housing units at an average density of 2 per square mile (1/km²). The racial makeup of the county was 91.60% White, 0.13% Black or African American, 0.62% Native American, 0.05% Asian, 0.03% Pacific Islander, 5.75% from other races, and 1.82% from two or more races. 20.95% of the population were Hispanic or Latino of any race. There were 1,607 households of which 25.90% had children under the age of 18 living with them, 59.10% were married couples living together, 7.70% had a female householder with no husband present, and 30.90% were non-families. 29.20% of all households were made up of individuals and 17.90% had someone living alone who was 65 years of age or older. The average household size was 2.31 and the average family size was 2.83. 22.40% of the population were under the age of 18, 4.70% from 18 to 24, 20.70% from 25 to 44, 28.80% from 45 to 64, and 23.50% who were 65 years of age or older. The median age was 47 years. For every 100 females there were 92.40 males. For every 100 females age 18 and over, there were 87.60 males. The median household income was $30,921 and the median family income was $39,360. Males had a median income of $28,125 compared with $20,000 for females. The per capita income was $20,931. About 10.10% of families and 13.20% of the population were below the poverty line, including 20.50% of those under age 18 and 13.30% of those age 65 or over. Anna Mebus Martin (1820–1864): Chartered the Commercial Bank of Mason, wealthy business woman and rancher. Louis (Ludwig) Martin (1820–1864): Co-founder of Hedwigs Hill, Mason County Justice of the Peace. Governor Coke Stevenson (1888–1975): Born in Mason County. Leonie von Meusebach–Zesch (1882–1944): Born in Mason County. Pioneer dentist. Frederick Benjamin "Fred" Gipson (February 7, 1908 – August 14, 1973) was an American author. He is best known for writing the 1956 novel Old Yeller, which became a popular 1957 Walt Disney film. ^ a b Rhoades, Alice J. "Mason County, Texas". Handbook of Texas Online. Texas State Historical Association. Retrieved 27 November 2010. ^ "Comanche Indian Treaty". William Nienke, Sam Morrow. Archived from the original on 18 July 2011. Retrieved 27 November 2010. ^ DeVos, Julius E. "Fort Mason, Texas". Handbook of Texas Online. Texas State Historical Association. Retrieved 27 November 2010. ^ "Mason County – Mason vicinity". Texas State Historical Markers. William Nienke, Sam Morrow. Archived from the original on 7 July 2011. Retrieved 27 November 2010. ^ "Texas Forts Trails". Texas Monthly: 72. June 1991. ^ "Texas Escapes-Fort Mason, Texas". Texas Escapes – Blueprints For Travel, LLC. Retrieved 27 November 2010. ^ Rhoades, Alice J. "Mason, Texas". Handbook of Texas Online. Texas State Historical Association. Retrieved 27 November 2010. ^ "History Fort Mason (1851–1871)". Texas Forts of the Old West. Legends of America. Archived from the original on 24 November 2010. Retrieved 27 November 2010. ^ a b "Mason County Courthouse". Texas Escapes – Blueprints For Travel, LLC. Retrieved 27 November 2010. ^ a b Lehmann, Herman; Hunter, J Marvin; Giese, Dale F (1993). Nine Years Among the Indians, 1870–1879: The Story of the Captivity and Life of a Texan Among the Indians. University of New Mexico Press. ISBN 978-0-8263-1417-8. ^ Hudspeth, Brewster. "The Savage Life Of Herman Lehmann". Texas Escapes – Blueprints For Travel, LLC. Retrieved 27 November 2010. Texas Escapes – Blueprints For Travel, LLC. ^ Gould, Florence C; Pando, Patricia N. "Mason Co Tx Women Homesteaders". Tx Gen Web. Archived from the original on 20 October 2010. Retrieved 27 November 2010. ^ "Gem of the Hill Country-Mason, Tex". Hill Country Portal. Retrieved 27 November 2010. ^ Johnson, David; Miller, Rick (2009). The Mason County ""Hoo Doo"" War, 1874–1902 (A.C. Greene Series). University of North Texas Press. ISBN 978-1-57441-262-8. ^ Johnson, David; Parsons, Chuck (2008). John Ringo, King of the Cowboys: His Life and Times from the Hoo Doo War to Tombstone, Second Edition (A. C. Greene). University of North Texas Press. ISBN 978-1-57441-243-7. ^ "Johnny Ringo and the Hoo Doo War". Retrieved 30 April 2010. ^ Garner, L Edwin. "Mineral Resources and Mining". Handbook of Texas Online. Texas State Historical Society. Retrieved 27 November 2010. ^ Leatherwood, Art. "Hereford Cattle". Handbook of Texas Online. Texas State Historical Association. Retrieved 27 November 2010. ^ Wentsch, George M. "Pedernales Electric Coop". Handbook of Texas Online. Texas State Historical Society. Retrieved 27 November 2010. This page was last edited on 27 July 2018, at 09:26 (UTC).